I Just checked, it was July 6th. I found this pic on an Australian government archive of old newspapers and magazines. There's loads of stuff in there that probably isn't well known about - plenty of crappy reports about the Beatlemania phenomenon, but some diamonds in the rough. I found an interview from the set of AHDN that I hadn't read before. 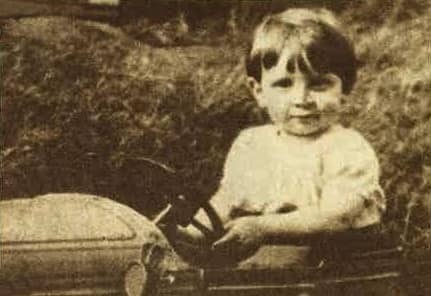 This pic is captioned "Toddler John in his toy car", and is from a 1964 edition of the Australian Women's Weekly. Has anyone seen this photo before? It's completely new to me, and I wonder if I accidentally stumbled upon a very rarely seen pic. What do you lot think? ^ I've never seen that photo before. I have a vague recollection of this picture, I think. Now this could be my mind deceiving me. I remember a pictorial article from years and years back. I think it was a front page Sunday Times Magazine. It was called "The Unseen Lennon". It was to mark an anniversary, or maybe even coincided with the release of Imagine : John Lennon . That far back. There was also an accompanying Hunter Davies essay. Something in my head is telling me this picture, or one taken at the same time, was included in the pictorial. However wrong or vague I might be about the publication details, I do remember the article, and it came into my mind as soon as I saw this picture. I do not recall seeing it anywhere else. And it could just be my mind playing tricks on me. Thanks for the link, by the way. That's somewhere I'm going to be exploring. Thanks for the info, mja. I'm surprised it hasn't been reused more often - normally childhood pics are all fairly well known, though I guess the Lennon family, the photographer (if known) or whoever owns the copyright might be very strict about granting licences. If you do explore that Australian site, do post any interesting links. I had a look up to 1964 (when they toured the country), but there's just so much to sift through. Any interviews or unique material would be good to see. Interesting to have another voice, and all us saying pretty much the same: Not willing to say it's not. As to the glasses, they may not be prescription but sunglasses. Difficult to tell from the angle. But we all know Paul rode a bike at that time, because he rode it to go and meet John a couple of weeks later. Whoever it is in the picture, they do seem to be sitting on a bike (the position of the arms looks like holding handlebars). I agree with the general sentiment of the thread that this photo (if actual) isn't significant to their history, but your speculation about a bicycle falls into what I was thinking; that this person is either quite tall (compared to other males in the photo) or he's on something. McCartney may have been the tallest (at least as tall) of the four, but he's under 6ft., and if on a bicycle, it would have to be pointed toward the stage. I don't know, I'm not a forensic analyst. I just don't think this is McCartney. Found this one on tumblr. I think it's probably late 50s early 60s. 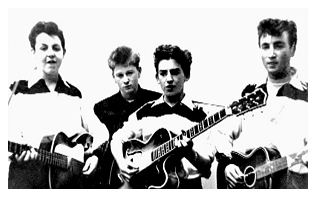 BeatlesWiki posted a page in support of a theory that a bespeckled Paul is in a photo of a Quarrymen performance a few days earlier than the famed July 6, 1957 date. I came back to this thread looking for a photo of Paul wearing glasses. 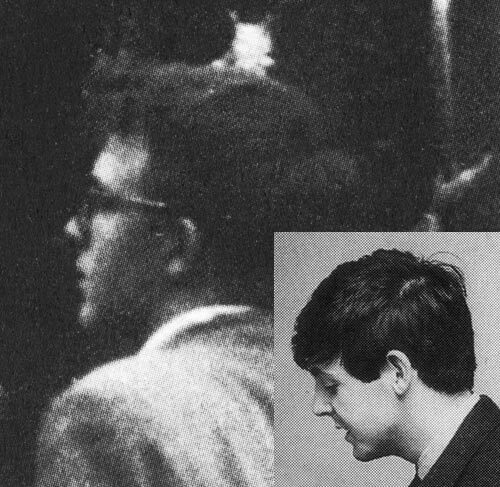 And it reminded me to put this question out there: now that we (many of us, anyway) have read Mark Lewisohn's claim that Paul and John had met at a local newsstand before the fete, does that influence whether or not you think that might be Paul in the picture? I found this pic of John, age eleven, and his cousin Mike, age four, in Mendips, circa 1951. This one was new to me. Anyone have seen it? @Ron Nasty, i find two more pics of this same day, look! is just showing off! Love the first of those two!!!! I'm sure you've all seen these type of 'ghost images' before? The merging of old photos with the same location today. It's of the Boys upstairs at the Childwall Abbey Hotel, I think it was the wedding reception of someone in George's family (sister?) This is from a Facebook page - Liverpool Then And Now - this chap's been doing these for a few years now, they're stunning. I'm still not convinced it's him though. No chance of such a question being asked never mind answered on Pauls website, they like hard hitting questions such as "where do buy your socks" and "what is your favourite type of tea?". 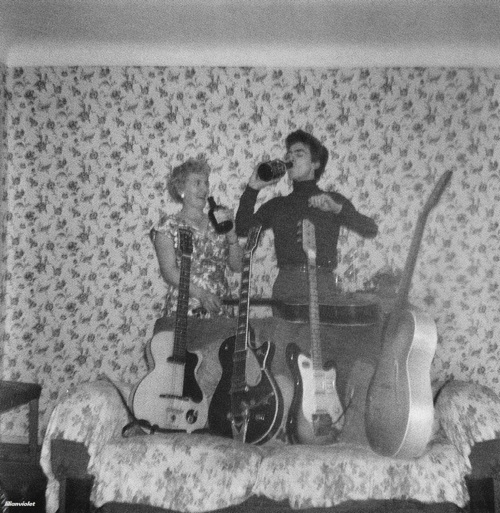 If feeling generous we might get "where do you get your song ideas from", a question we've heard the answer to since 1963. Also, if Paul is invested in the story that he and John didn't formally cross paths until July 6, 1957 as Mark Lewisohn seems to believe, I doubt he'd admit to it being him. Who said anything about Mark Lewisohn having an opinion on this? Some people have looked at the photos and think it doesn't look like him, is all. I'm not one of them, but, seriously, calm down.